Jay Rodriguez is a Grammy Nominated Saxophonist, Flautist, Clarinetist, Film Composer, Producer and Arranger. He was born Hernan Ramiro Rodriguez-Sierra in the coastal port city of Barranquilla Colombia on September 17, 1967. His family immigrated to NYC when he was 3 in 1970. He commenced his musical studies at the age of 7 on clarinet. When he turned 10 he began studying alto saxophone and conducting with Tito D Rivera (Father of the famed Paquito D’Rivera ). Mr Tito D Rivera was a famed Classical saxophonist of his generation. By the time Jay turned 12, he had begun studying saxophone with Joe Allard. Other teachers included Saxophonist/flautist – Jesus Garcia, Mark Friedman, Kenny Hitchcock, and Emile De Cosmo. At 13 Paquito D Rivera would take Jay to sit in and play with him around town. 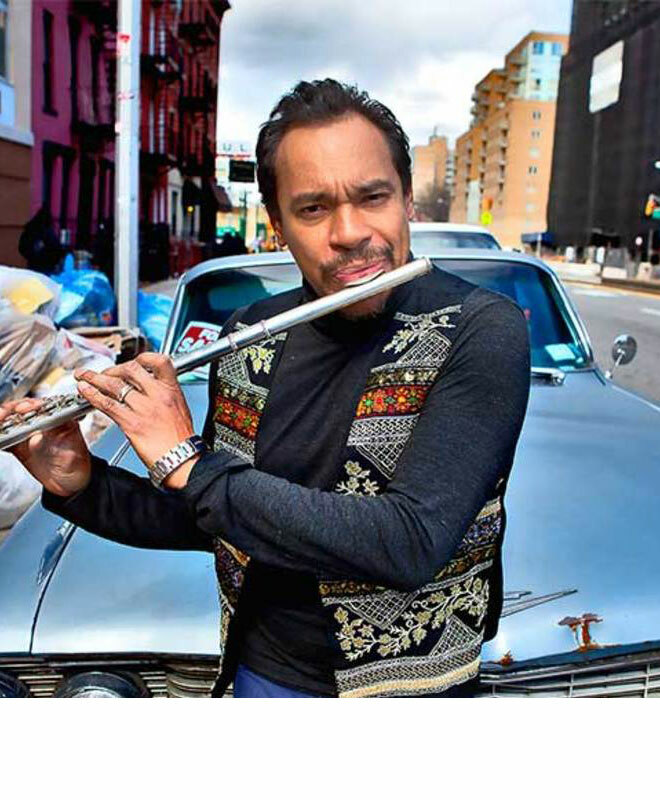 He featured him as a guest soloist at the famed Salsa Meets Jazz concerts at the then well known Village Gate. There he met Jazz legends like Stanley Turrentine, Ray Barretto, Tito Puente, Victor Venegas and Dizzy Gillespie to name a few. He went on to work with the well known Jazz and Latin artists like Wilfredo Vargas, Bross Townsend, Vincente Pacheco, Celia Cruz, Jose Alberto, Candido and many more. At 14 he was chosen to attend the High School for the Performing Arts (now known as La Guardia) in NYC at the time located on 46th st. His classmates at the time included Billy Charlap, Jon Gordon, Jennifer Aniston and Justin Robinson. Jay co founded the NYC phenomenon of the early 90’s the Groove Collective which influenced bands like the US 3, Roots, a Tribe called Quest and Modern Hip Hop and Dance music. Jay Rodriguez is the consummate artist .His resume reads like a who’s who of the music world. He has performed, produced recorded and or arranged for artists like Elvis Costello, Medeski, Martin and Wood, Roy Hargrove, Fred Wesley, George Porter Jr, Teruo Nakamura, Bobby Sanabria, Musiq Soulchild, Natalie Cole, Little Louie Vega, Dennis Ferrer, Melissa Manchester, Film Directors Godfrey Reggio, Shawn Batey and Michele Stephenson, Mino Cinelu, Alex Foster, Alex Blake, Patti Labelle, Sara Dash,Guru, DJ Nicodemus, DJ Premiere, Chucho Valdez, Victor Jones, Arturo O Farrill, Bernie Worrell, Roy Hargrove, The Roots, The Mingus Big Band, Al Macdowell, Widespread Panic, Mike Clark, Kenny Barron, Dave Schools, Widespread Panic, Irakere, Mongo Santamaria, Eddie Palmieri, Selah Sue, Jerry Wonda, The Gil Evans Band, Celia Cruz, Doc Cheatham, Miles Davis, Prince amongst many. He has taught/lectured all over the world including the Royal Academy of Music in Denmark, Berlin, Estonia, Japan, University of Cairo, Uninorte in Colombia and Unam in Mexico. Some of Jay Rodriguez’s achievements have been recorded in Leonard Feather-Ira Gitler’s The Biographical Encyclopedia of Jazz. Jay currently is busy as a TV, film/documentary composer, arranger and soloist on his respective instruments. He has been a guest on the Jimmy Fallon Show with the Roots as a soloist for English sensation singer song writer Michael Kiwanuka and Jim James of my Morning Jacket.